Huge fluffy beach towels. The intoxicating scent of sunscreen. Drinks with a mandatory umbrella at 4 o’clock, the Pacific Ocean a few steps away. Summer is officially here. 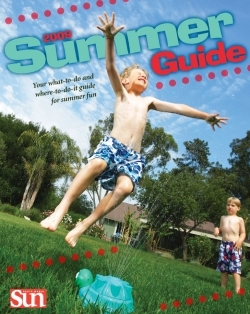 Well, it will be on June 21 and that is where the Sun’s Summer Guide comes in handy. We are so darn special, the Guide, as it’s known around these parts, will come out a month early (May 21) and it’s all in devotion to our wanna-be busy/entertained readers. The Guide is close to my heart. I spent hours, days, and nights, pouring over e-mails, phone messages, print outs, websites, brochures and itty bitty bits of paper with my awful handwriting, to bring to you the latest and greatest of absolutely everything that is happening from May 21 through the end of September. Experience a real rodeo at the Santa Maria’s Elks Rodeo June 4 through 7. Looking to rock out at a summer concert? Arroyo Grande’s Village Summer Concert Series will be running all summer long. Want to take a trip back in time? Head to the Dana Adobe Nipomo Amigos 10th annual Heritage Day celebration on July 19 at the historical Dana Adobe in Nipomo. This just scratches the summertime surface of what is in store for residents of Santa Barbara County, and anyone else smart enough to pick up this larger-than-life edition of the Sun. I don’t want to hear about the economy. And I’m sure neither do you. Summer is the time to take a break. From the hustle and bustle, from the mundane that is life. From reality. During this season, your mission, if you choose to take it, is to have as much fun as possible—work hard, play hard. Without breaking the bank. The Guide offers endless activities that cost next to nothing, so explore your very own backyard and what it has to offer, what organizations have painstakingly planned for you to partake in. The Guide will even tell you the best places to camp, hike, rent a kayak, ride a horse, or simply take a walk in the sunshine. 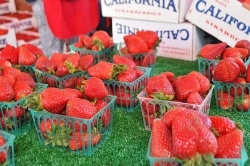 Take a tour through the private gardens in Grover Beach or taste some epicurean delights in Shell Beach. All of this can be found throughout the Guide’s 17,000 words of listings. On an entirely different level of enjoyment and wonderment there are the kiddies. We need to keep children busy, yet thriving, and out of the house to enjoy the glorious days of sunshine. Let them roam, play, and be free this summer. The Guide guarantees you will find a tremendous amount for them to do over the next three months. Traditional day camps happen all over Santa Barbara County, kids can reach deep within to find their inner Picasso, or try out their acting chops at the Melodrama. Your little ones (and big ones) can surf all summer if they want. Want to learn about Harry Potter? Done. Hone those creative writing skills? Done. Make a movie? Done. Kids can even learn about money management or become the next Coco Chanel. If all of this still isn’t enough to whet your summer appetite, I invite you to e-mail or call me directly for more suggestions. I promise to be your very own Summer Activities Director. Scouts honor. Christy Heron, calendar editor and writer at the Sun’s sister paper, New Times, can be reached at cheron@newtimesslo.com.